The figure is 8% of the Danish company's 18,200-strong workforce, but it is not clear where the jobs will go. Lego said in its half-year results that revenue fell 5% to 14.9bn Danish krone (£1.8bn, $1.3bn), with profits down 3% to 4.4bn krone. The company said it needed to make the job cuts as its business had become too complex and needed a "reset". Lego chairman Jorgen Vig Knudstorp said the group had become an "increasingly complex organisation" following double-digit global growth in the past five years. However, that meant it had "added complexity into the organisation which now in turn makes it harder for us to grow further". Lego told the BBC: "In the US and Europe, our sales have declined although we are working hard with our partners to regain momentum." 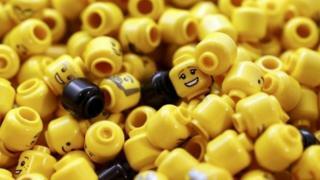 Lego said there was double-digit growth in China where there was still "massive upside potential". Mr Vig Knudstorp said: "We are disappointed by the decline in revenue in our established markets, and we have taken steps to address this." It has also been diversifying in recent years, most strikingly into a series of Lego movies, the latest being Batman movies depicted by Lego figures. Mr Knudstorp hinted the company would be concentrating harder on the brick kits, but without going entirely back to basics: "The brick is the heart of our business and children of all ages love it. "We will find more opportunities to engage with kids and parents including innovative ways to blend physical building and digital experiences, such as our successful Lego Life social platform." Last month Lego said Niels Christiansen, a Dane, would replace Briton Bali Padda as chief executive. He had been in the post for just eight months. Lego has become the world's biggest toymaker by sales, beating Play-Doh maker Hasbro and Barbie giant Mattel, whose sales are around £1.4bn. The company said the jobs would go by the end of this year but there would be redundancy packages and other support. Mr Knudstorp said: "We are very sorry to make changes which may interfere with the lives of many of our colleagues. Unfortunately, it is essential for us to make these tough decisions."